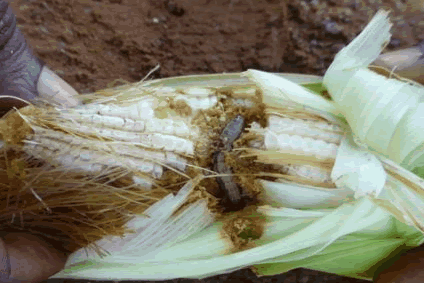 Ghana is estimated to have lost about $64 million through the fall armyworm infestation. The pests, detected in the country some 15 months ago, have since attacked more than 20,000 hectares of farms, nationwide. Research scientists attached to the Biotechnology Research Programme (BRP) of the Crop Research Institute (CRI), have prescribed a solution – to end the havoc the armyworms have been wreaking on farms. They are urging the development and use of genetically-modified (GM) maize to stop the destruction the pests are causing. Professor Mrs. Marian Quain, Leader of the BRP, said studies had shown that genetically-modified maize with in-built disease-resistant genes had the potential to withstand the harmful effects of the pests. This had been due to the changing climatic conditions, overpopulation, excessive use of pesticides and insecticides. Prof Mrs. Quain asked that the nation facilitated the processes for the acceptance of GM-related technology in plant breeding and crop production to enhance food security, given the emerging threats to agricultural productivity. The programme brought together agricultural researchers, extension officers, plant breeders, seed growers, environmentalists, health experts and the media. The goal was to sensitize the participants on genetically-modified organisms (GMOs). Topics discussed included “Africa’s agricultural sector challenges and GMOs”, “Producing transgenic plants”, “Steps in modifying an organism”, “Transformation of plant tissue”, “Genetic transformation procedure” and “Following bio-safety guidelines”. Prof Mrs. Quain said the BRP would continue to engage policy-makers and stakeholders for the adoption of GM-related technology to address agricultural problems. She spoke of how countries like Burkina Faso and South Africa had made huge gains in addressing food insecurity, using this technology to their advantage. Prof Emmanuel Otoo, a Principal Research Scientist of the CRI, said for a country hoping to improve its food stock, science and technology remained the most important tools to achieve that. Mr. Eric Okoree, Chief Executive Officer (CEO) of the NBA, advised the people to overcome any negative perceptions about the GMOs because the nation could no longer rely on the traditional agricultural practices to feed the growing population.